Web 2.0 and social media is purported to be a driver of citizen engagement and participative capacities. 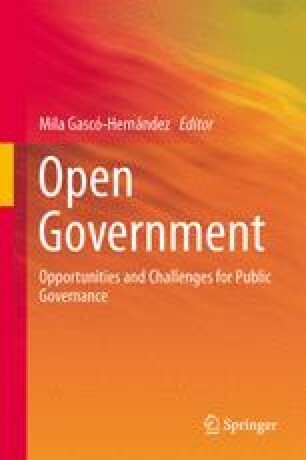 However, there are tensions between these open networked technologies, and traditional democratic and administrative governance systems. These tensions create a set of tensions between communications and engagement stemming from the deployment of Web 2.0 and social media technologies. This chapter examines social media trends and usage at the local level in the Canadian province of Nova Scotia. Studying both administrative and electoral usage in the autumn of 2012, we found that social media platforms are still new for municipalities and local politicians in the province with only half of municipalities and half of the politicians in the two major urban centers using social media. Moreover, they used social media primarily as a means toward one-way information sharing and communicating. As Web 2.0 technologies continue to proliferate, and as governments continue to experiment, a more open, outward and interactive public sector, both administratively and democratically, is needed in order to foster capacities for genuine engagement. Association of Local Government Information Management Inc. (2009). A Roadmap to E-democracy in New Zealand local government. ALGIM E-Democracy Research Paper: http://www.algim.org.nz/Documents/Whitepapers/ALGIM%20Edemocracy%20Whitepaper%20FINAL.pdf. City of Calgary. (n.d). Business plans and budgets 2012-2014: Overview & citizen summary. http://www.calgary.ca/CA/fs/Pages/Plans-Budgets-and-Financial-Reports/Business-Plans-and-Budgets-2012-2014/Business-Plans-and-Budgets-2012-2014-Overview.aspx. Clarke, A. (2010). Social Media: 4. Political uses and implications for representative democracy. Library of Parliament. http://www.parl.gc.ca/Content/LOP/ResearchPublications/2010-10-e.htm. Embaye, H., Navratil, P., Ng, D., & Yang, S. (n.d.). Social Media Primer for Municipal Governments. http://www.lgma.ca/assets/Misc/Social-Media-Primer-Research-Paper.pdf. Fyfe, T., & Crookall, P. (2010). Social Media and Public Sector Policy Dilemmas. Toronto: Institute of Public Administration of Canada: Toronto. http://ipac.ca/documents/correction-June10.pdf. Good Neighbours, Great Neighbourhoods. (n.d). In Facebook [Fan Page]. https://www.facebook.com/PlanHRM. Accessed 2 March 2013. Halifax Regional Municipality. (n.d). Social media. http://www.halifax.ca/socialmedia/. Huijboom, N., van den Broek, T., Frissen, V., Kool, L., Kotterink, B., Nielsen, M., & Millard, J. (2009). Public Services 2.0: The Impact of Social Computing on Public Services. Brussels: Office for Official Publications of the European Communities http://ftp.jrc.es/EURdoc/JRC54203.pdf. International Association for Public Participation. (2007). IAP2 Spectrum of Public Participation. http://www.iap2.org/associations/4748/files/spectrum.pdf. Lee, G., & Kwak, Y. (2011). An open government implementation model: Moving to increased public engagement. IBM center for the business of government. http://www.businessofgovernment.org/sites/default/files/An%20Open%20Government%20Implementation%20Model.pdf. Mossberger, K., & Wu, Y. (2012). Civic engagement and local e-government: Social networking comes of age. Institute for Policy & Civic Engagement, University of Illinois at Chicago: http://www.uic.edu/cuppa/ipce/interior/CELocalEGovSMFullReport2012.pdf. Mota, J., & Santinha, G. (2012, July 16). Social media and civic engagement: Discussing the case of Aveiro, Portugal. European Journal of ePractice. http://www.epractice.eu/en/document/5377051. Nova Scotia Community Counts. (2011). Population by 5 year age groups. http://www.gov.ns.ca/finance/communitycounts/topicview.asp?tnum=51&gval=mun&s=Demographics&yval=2011&vval=&vval1=Total&vval2=Number&vval3=. Roy, J. (2012, May 7). The rise of municipal government 2.0. Canadian Government Executive, 17(3). http://www.cangovexec.net/category/item/227.html. Serrat, O. (2010). Social media and the public sector. Knowledge solutions. International Publications, Cornell University ILR School: Ithaca, NY http://digitalcommons.ilr.cornell.edu/cgi/viewcontent.cgi?article=1191&context=intl. Thomas, R. (2012, February 3). Participatory budgeting in Canadian municipalities?. http://www.renthomas.ca/urban-planning/participatory-budgeting-in-canadian-municipalities. Transit Cooperative Research Program. (2012). TCRP synthesis 99: Uses of social media in public transportation. http://onlinepubs.trb.org/onlinepubs/tcrp/tcrp_syn_99.pdf. Weeks, W. (2012, December). Spotlight on Social Media. Municipal World, Union, Ontario: www.municipalworld.com http://elevenpr.squarespace.com/storage/Spotlight%20on%20Social%20Media%20-%20Municipal%20World%20Magazine.pdf.